When I was at D23 Expo, I saw a fabulous display of Mickey and Minnie Mouse kitchen products. I thought, “this would be my dream dining room!” Although I had lived at my home for two years, I hadn’t really done much to decorate our eating area Disney style. Once I saw that amazing display, I decided to find the Vandor Products items that made the beautiful Mickey and Minnie dining room on the D23 Expo showroom floor. 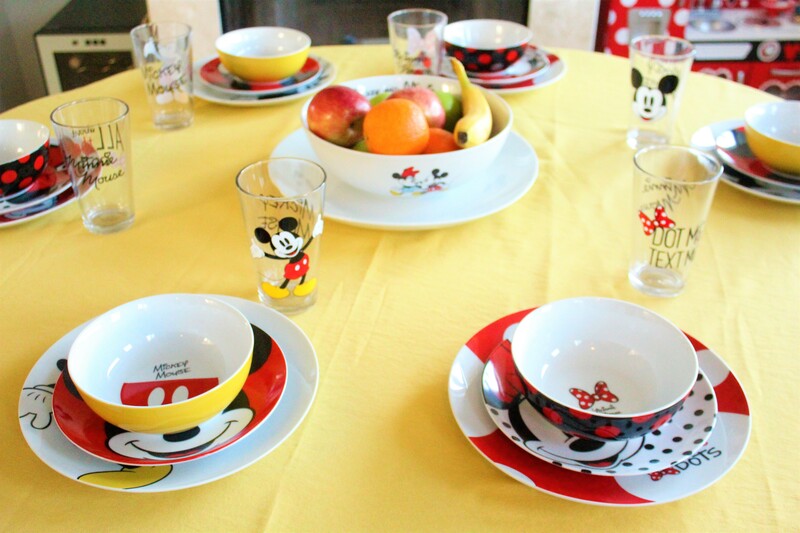 The main part of the dining room were Mickey and Minnie Mouse dinner plates, salad plates, and bowls. The dinner plates come in three varieties, two Minnie styles and one Mickey style you can find here. The Mickey salad plates are red with a vintage Mickey face, and the Minnie salad plates are polka dot with vintage Minnie faces. The Mickey bowls are yellow on the outside, with the inside having his red shorts and his signature. The Minnie bowls are black and red polka dot’s, with her signature and a bow inside. The Mickey glasses are clear, with a Mickey Mouse on one side, and Mickey’s signature on the other. The Minnie glasses have her signature on one side, and different fun and sassy sayings on the other, different on each cup. The centerpiece was a Mickey and Minnie platter, with a Mickey and Minnie Mouse serving bowl sitting on top. We now have this always out as our fruit bowl and kitchen centerpiece! Last but not least, a Mickey-shaped clock, with Mickey and Minnie faces, and Mickey hands as the clock’s hands! I just can’t get enough of our Mickey and Minnie kitchen makeover with Vandor products! It definitely adds a lot of fun and cheer to our time together in the kitchen! A One-of-a-Kind Event Coming to Anaheim’s Only Rooftop Bar!